The countries that are today the G-7 leading democratic economic powers all underwent radical political changes between 1865 and 1871. The United States abolished slavery and suppressed the southern insurrection, at a cost of a terrible war that left 750,000 people dead in a population of 31 million, and five states smashed to rubble. Eighty-four years after Washington took Yorktown, the United States emerged from the Civil War one of the greatest powers in the world, along with Great Britain and the about-to-be-created German Empire. Another century would be required to end racial segregation in America, but in the 50 years before the First World War, the American population would almost triple, and the American economy and industrial power would grow to a scale that the world had never imagined to be possible. In 1867, the British Parliament passed the Second Reform Act that doubled the size of the British electorate. 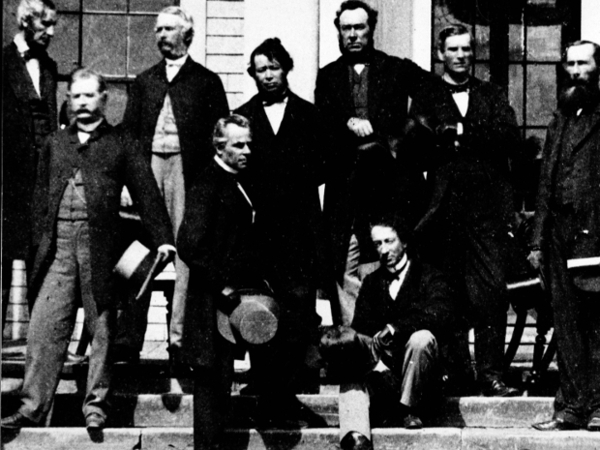 (The British North America Act, establishing the Confederation of four Canadian provinces—Quebec, Ontario, Nova Scotia and New Brunswick—was passed and adopted in gaps in the fierce debate over the Second Reform Act.) Britain took a giant step toward being a full male-suffrage democracy, staying approximately equal to the United States, Netherlands, Switzerland and parts of Scandinavia in the vanguard of national popular democracies. In 1868, the Japanese (galvanized by American Commodore Perry's opening of the Japanese ports in 1853, with larger and more sophisticated ships than Japan possessed) centralized government under an emperor with a mandate to end isolation, import and emulate advanced Western industrial techniques, and make Japan a great power of the Western Pacific. In Europe, the sleepy and reactionary post-Napoleonic division of authority between France, Prussia, Russia and the ramshackle empire of the Habsburgs centred in Vienna, with Britain gently shifting its influence between the powers to assure that none predominated, continued desultorily through the middle of the 19th century. Since Cardinal Richelieu's time more than two centuries before, the key to the arrangements of Europe was keeping the Germans, and less importantly, the Italians, divided. Richelieu's ultimate successor as the dominant statesman of Europe, Otto von Bismarck, minister-president of Prussia from 1862, slapped down Denmark, the Austrians, and then defeated France in the Franco-Prussian War of 1870. Napoleon's unserious nephew, Emperor Napoleon III, was captured and sent packing. Bismarck seized Alsace and Lorraine from France, and as bloody revolution and chaos erupted in the Paris Commune, Bismarck founded the united German Empire in Versailles, and France founded the Third Republic, bent on recovery and revenge. The unification of Italy, for the first time in 14 centuries, was achieved in a series of wars ending in 1871, and the country emerged as a united secular state. Thus, in these six years, Germans and Americans became united and mighty world powers, Italy became a Mediterranean power, Japan launched itself as a potential Pacific rival to the U.S., France returned decisively to republicanism to recover its former eminence in Europe, and Britain kept pace in the pursuit of democracy with its apostate American offspring. Bismarck's only contemporary European rival as a world statesman, Benjamin Disraeli, told the British House of Commons on Feb. 2, 1871, that the "Franco-Prussian War is the German revolution, a more important political revolution than the French Revolution ... You have a new world, new influences at work and unknown dangers.... the balance of power has been utterly destroyed, and the country that suffers most, is England." He already detected that Germany could be too powerful to be contained even by France and Britain together, allies for the first time since Charles II. Britain's friendship with Germany, source of its current monarchy, and its coolness with the French and Americans, were about to require a sharp reversal, while the United States would have to cope with an unsuspected trans-Pacific rival in Japan. Canada, the last member of the current G-7, of course, also participated in this international reorganization. As the United States emerged from its Civil War with the greatest army and greatest generals in the world, and no reservoir of goodwill for Britain after The British flirtation with the Confederacy, French and English Canadian political leaders, both conservative and liberal, realized that the string of settlements and communities along the northern border of the United States, if they were not to be swallowed whole by the rampaging Americans, must join in one new country, of sufficient value to Britain to retain British naval deterrent strength against an American annexation. The British could not now refight a ground war in North America, but their naval supremacy could cause great inconvenience along the American shores and on the high seas. This, and the exhaustion of their long war, is all that restrained the United States from seizing Canada, as it has seized a million square miles from Mexico (including Texas and California) 30 years before. Thus was Canada born, in an atmosphere of some fear and some skepticism (as many British and Americans doubted the new country, which sought to be the first trans-continental, bi-cultural, parliamentary confederation in history, would long survive). But the world's most ambitious railway, built across the Canadian shield and financed by external capital sources, was quickly established. Western native revolts and various agitations for annexation were suppressed or out-witted. The Canadian project made its way determinedly in the world. There has never remotely been anything like the surging rise of the United States to a position of unprecedented national predominance in the whole world, and the magnetic force of it at close quarters has been a benign menace to Canada's self-confidence and raison d'etre for most of these 150 years. Yet Canada did keep pace with that rise, and the fact that it kept the population and economic ratios between itself and the United States even through this period, and in fact narrowed them somewhat, while a smaller achievement in absolute terms than the rise of America, has been in some ways greater. It has been carried out without the ability to conduct a mighty propaganda and theatrical promotion of the American mythos, a folklore riddled with historical inaccuracies but fundamentally a justified celebration of the inexorable (until very recent years) rise of a mighty nation that has been the great engine of the spread of democracy and of the free market in the world. Canada has, as the French say, the fault of its qualities. Because it is always consensual and never revolutionary, it has relatively less drama than have had the other G-7 countries. The German Empire collapsed at the end of the First World War, the Third French republic early in the Second. The monarchy of a united Italy, after a disastrous 25-year fascist interlude, was dispensed with at the end of the Second World War, and for all its qualities, no one, least of all the Italians, would point to Italy as a political model. The absolute and imperialist Japanese Empire was replaced amid atomic mushroom clouds by the generous military government of General Douglas MacArthur. No countries with a population as large as Canada's now is, have had continuous political institutions for longer than Canada has, except the United Kingdom and the United States. In this time, there have been fewer than 50 deaths in Canada from civil disturbances, and three murders of prominent political figures (D'Arcy McGee, George Brown, Pierre Laporte). No country welcomes immigration so positively, and very few have as little violence in society. The country has engaged in four wars, all just and successful wars where our forces acquitted themselves with distinction and almost all were volunteers, though Canada itself was never under direct threat. It is not a record that lends itself to great dramatization. Our (splendid) war memorials are overseas in the countries we were defending or liberating. It is not in the nature of Canadians to boast very effusively. But it is a national history to be proud of, and all Canadians, in their own way, should be proud of it, of these 150 years, this July 1.